Gina, my girlfriend, is a successful business woman who runs her own company, which implies she has to be pragmatic in order for her business to succeed efficiently. She takes care -probably a lot- of what she says, so for instance she would never say something is awful but rather not nice. Definition through complementarity seems to be the norm in the business world in order to be as likable as possible and thus never driving potential customers away. We scientists on the other hand say things the way they are and hence we are taken by arrogant most of the time. And we are arrogant because we like things right. Even if we understand what you mean with an ill posed sentence, we’ll point out the implications of posing it in a wrong way or just blatantly correct your phrase. We deal with understanding and modifying our surrounding world –the real world, our real world– and, above all things, we love being right! Thus we leave little room for wrong when it comes to other people. Yes. I’m a chemist, I have a PhD and work at a university doing research; that is enough to qualify for The Big Bang Theory cast, right? and if all resemblance is transitive then I for sure spend my Wednesday evenings at a local comic book store, right? Well, wrong! (ha! I loved that one!) But to be completely honest accurate, I do enjoy science fiction a lot. I like the classics such as Asimov and Bradbury as well as Lem and Vonegut. When it comes to cinema I consider myself a huge fan; I prefer Star Wars over Star Trek (if pressed) but particularly enjoyed the latest Star Trek installment more than any of the ones in the new SW trilogy, except maybe for “Revenge of the Sith“. When it comes to fantasy I prefer movies than literature; I’ve never read LOTR and I don’t think I will, but I’m about to re-read The Hobbit during the holidays (I need my leisure reading during the next two weeks). Back to my pragmatic girlfriend. She doesn’t like sci-fi or fantasy; “fakey” she calls them. For her, achieving suspension of disbelief is nearly impossible and that has made me reflect on where this cliché of us liking sci-fi and fantasy so much comes from. Science fiction is very appealing to us because allows us to set our imaginations wild and dream about what we could achieve in the future with our own work in terms of technology development (Does Gina dream about building a corporate empire? I’ll ask her tonight). Some of these achievements would involve the verification of wacky scientific theories (think about warp speed in Star Trek and how it implies that speeds faster than light are achievable via the Alcubierre metric in this instance) or the advent of a new set of them. Despite the popular belief, those in the science business have to be very creative people; we cannot simply spend the rest of our careers doing what others have already achieved (although there is an increasing number of people trying) so we all try to stay on the cutting edge even if that only generates a million different cutting edges, some of which become sharper than others. We have to be imaginative, believers of the unbelievable, for only this way we can come up with the technology that eventually makes current sci-fi look fakey. The real world of stock exchange, bills, mergers, negotiations and taxes is very elusive to most of us if not just down boring. The really remarkable thing between us is that both our worlds are able to coexist, and even more so, we support each other in our careers through success and failure, despite the fact we often don’t understand what is going on. I will continue being the geek within her -now our- circle of friends; I will embrace it and own it. Gina on the other hand will continue being the business woman among my circle of friends from grad school; she will have to keep on nodding when we talk about academia and sci-fi; when we complain about the scarcity of liquid Nitrogen in our labs or we get excited about a new computing cluster with an increasing number of Xeon processors. It’s just a lot of real fun to merge these two real worlds. Happy holidays, blogosphere! 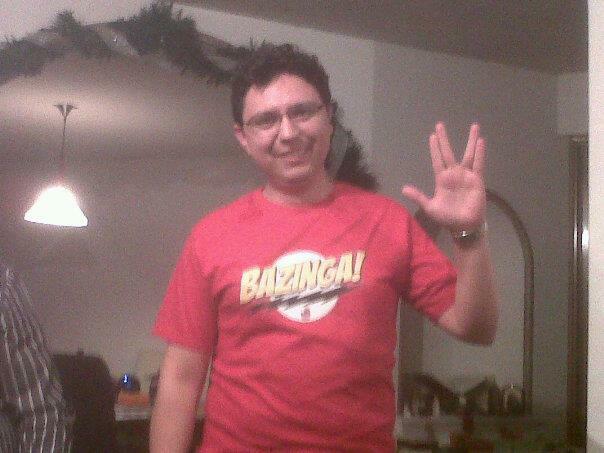 Live long and prosper. Posted on December 19, 2011, in Random thoughts, Science and tagged Random thoughts, sci-fi, Science. Bookmark the permalink. 2 Comments. As that old quote said: ‘Reality is for those who can’t handle science fiction’, I’m a fan of science fiction too, I have some issues with reality itself, so I choose not to beleive in it hahaha. Just like your gff (a great person, btw :)) I know a lot of people who can’t stand science fiction, of course I find that a little disturbing, but it is fantastic to find people so different from you and still love them :D.
Thanks as usual for your kind words! And you are right, reality is for those who can’t handle sci-fi!! !